LED (Light Emitting Diode) light technology encompasses the way certain wavelengths of light can be used to improve the appearance of your skin. It has also been described as photodynamic therapy (or PDT). There is nothing really new about LED therapy. Over 200 years ago, a Danish physician (Dr. Neils Finsen) received a Nobel Prize for demonstration of how various wavelengths of light could be used to treat tuberculosis. NASA has used LED technology in space for many years to promote wound healing and tissue growth. There has been over 40 years of research showing how LED light is highly beneficial to the skin. 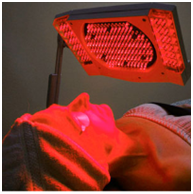 Red Light Therapy (633nm – 830nm) penetrates the human skin to a depth of 8-10mm. This means it gets into the dermis where those fabulous fibroblasts reside. Stimulation of fibroblasts results in an increase in collagen and elastin. Skin layers, because of their high blood and water content absorb this light very well. Red light therapy improves blood flow, which allows for improved oxygenation and nutrient delivery to the cells in the skin. Red light carries strong anti-aging qualities and works on a cellular level. Improvement of Melasma – The American Journal of Dermatology and Venereology 2014 demonstrated safe and effective use of red LED (633nm and 830nm) on melasma in skin type VI (darkest skin type). Participants demonstrated improved skin texture, more even tone, reduction of porphyrins, and reduction of fine lines and wrinkles. Improvement of Psoriasis – Seminars in Cutaneous Medicine and Surgery (Aug 2014) demonstrated no adverse side effects and a resolution of psoriasis in a (small) patient population that had psoriasis resistant to conventional therapy. 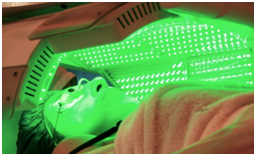 When red LED light is used for facial rejuvenation, treatments are typically performed weekly. More treatments = more results. Blue light therapy is of a short wavelength (450-510nm). Blue light is right next to UV light on the electromagnetic spectrum and brings the antibacterial properties of UV light, without the risks associated with UV exposure. Blue light therapy penetrates the skin very superficially (approximately 1 mm). However, it has been shown (and FDA approved) to kill the bacteria associated with some forms of acne (Propionibacterium acnes, or ‘P.acnes’). P. acnes produce porphyrins as part of its normal metabolism. These porphyrins absorb blue light (and red to a lesser extent) generating reactive oxygen which is toxic to the P. acnes bacteria. 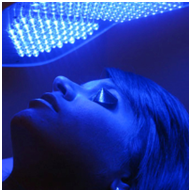 My opinion is that Blue light therapy indeed plays a role with the treatment of acne. The use of blue light therapy combined with the right dietary and topical regimen is a recipe for significant improvement of mild to moderate inflammatory acne. Both blue and red light can be used concomitantly to treat acne. Blue light, as noted though its ability to clear bacteria; Red light through its action on a cellular level help reduce inflammation and hasten skin healing. Blue light, while clearly a means to improve mild to moderate inflammatory acne, is far less affective for cystic acne, blackheads and whiteheads. Clinical trials have shown the need for up to 20 treatments for optimal results (Twice a week for 8 weeks then once a week for four weeks). At $50-100/treatment, this may become an expensive endeavor. Blue light’s second claim to fame is in the treatment of seasonal affective disorder. In 2009 The Journal of Depression and Anxiety showed that blue light treatment was effective in reducing the symptoms of seasonal affective disorder. As far back as 1500 BC, the Greeks were the first to record a suggestion that exposure to light indeed had the potential to help “restore health.” I have countless patients through the years who have benefited greatly, particularly in the winter months, through the use of light therapy. 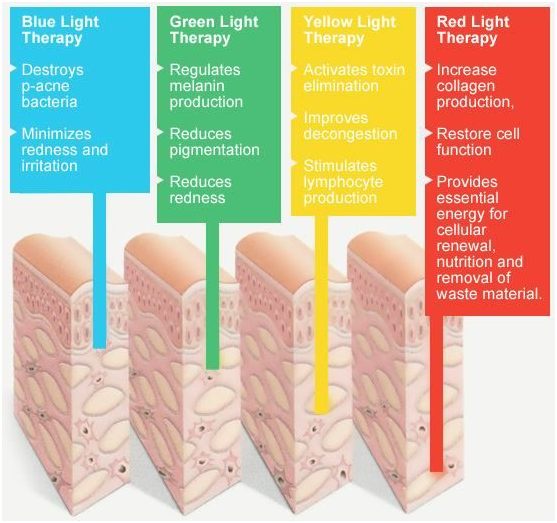 Green light therapy typically falls in the wavelength range of 515 nm to 520 nm and is most frequently used for skin treatments aimed at anti-aging and removal of unwanted pigment.Green LED therapy can help to fade the appearance of freckles, age spots (or sun spots), brown patches or uneven skin pigment. This is also known as yellow or orange light therapy. It has been shown to be beneficial in treatment of skin redness, irritation and small veins (telangectasias). It also helps improved lymphatic drainage and flushes waste from the skin. Like the name implies IPL stands for ‘Intense pulsed light.” While LED may have similar wavelengths as IPL, the delivery of the energy is far different. IPL pulses are delivered at a high energy over a fraction of a second. This means there is certainly a higher chance of a burn as well as pain with IPL treatments. IPL is my preferred treatment for clearance of brown pigment on lighter skin types. Blue light LED can be helpful in treatment of mild/moderate inflammatory acne. Red Light LED, in addition to its anti-aging benefits, has been shown to improve both melasma and psoriasis and is safe and effective on darker skin types. IPL treatments, while more painful, typically require far fewer treatments and results are seen more quickly. LED is an excellent choice for someone who has mild/moderate symptoms and cannot tolerate any downtime. IPL is great for pigmentation , whilst LEDs can help with collagen stimulation and healing times. LED light has also been used to relieve skin inflammation following certain laser procedures. LED therapy has been gaining some momentum in recent years and certainly has a solid position in the world of medical aesthetics. IPL, while giving more noticeable results in fewer treatments, may not be for everyone, particularly those with darker skin types. It is important to note that it is suggested that one wear eye protection when using LED, particularly blue light LED which has been shown to be potentially damaging to the retina. Also, speak to your doctor or aesthetician prior to undergoing LED therapy. Explain any medical conditions you may have as well as any medications (such as Accutane and Vitamin A (Retin-A) which may make your skin more sensitive to LED treatments.